At CareCo we value and respect our customers and believe that you should get the most out of your experience shopping with us. We understand that mobility equipment is costly, which is why we're always trying to bring you the lowest prices and best deals. So why not sign up for our CareCo Club? It's the best way to take advantage of our services and discounts. What can you expect from the CareCo club? 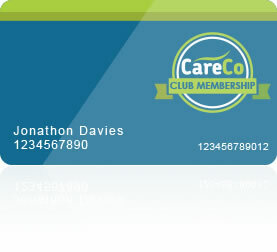 For a yearly payment of £20 you'll become an active member of the CareCo Club. So, what does this include? £10 off Every Order over £50 (excluding delivery charges): Ideal for expensive items or bulk buys, we'll take £10 off of every order over £50. Imagine how much money you could save in the long run! Magazine Subscription: Our mobility magazine will keep you up-to-date with all the latest news and product releases here at CareCo. Ask the Experts: Got a problem? Just ask our friendly team of experts. They'll be happy to get back to you with professional and friendly advice. Members Only Exclusives: As a CareCo Club member you'll be able to take advantage of our exclusive deals, discounts and offers, helping you to save money.